← FLYING FISH IN BARBADOS!! 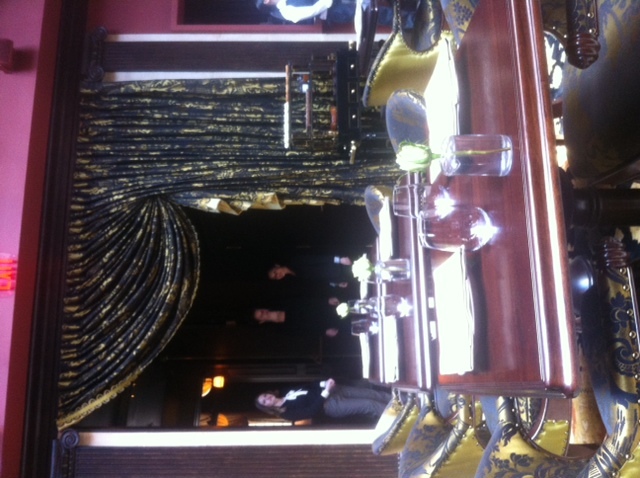 The very lovely and comfortable dinning room just recently opened at the brand new- NoMad Hotel. NoMad or North of Madison Square Park is a relatively new and upcoming area of our city with several trendy boutique hotels and restaurants. Conveniently nestled between Gramercy Park, Chelsea and The Flatiron District; the NOMAD Hotel is an upscale European Modern boutique hotel with 168 rooms. The beautifully restored beaux-arts building has been expertly designed by Jacques Garcia. Luncheon today was shared was shared with a dear friend and colleague; Mr. Harald Mootz Assistant Chef Concierge of the St. Regis New York. Together we relaxed in the very comfortable Atrium space which is the middle of the dinning room with adjacent drapery side rooms. There is also a magnificent 24 Foot Mahogany Bar run by the award winning mixologist, Leo Robistchek. The Food and Beverage operation is probably one of my favorite Chef/Manager team and partnerships: Chef Daniel Humm and Will Guidara from the award winning Eleven Madison Park!! 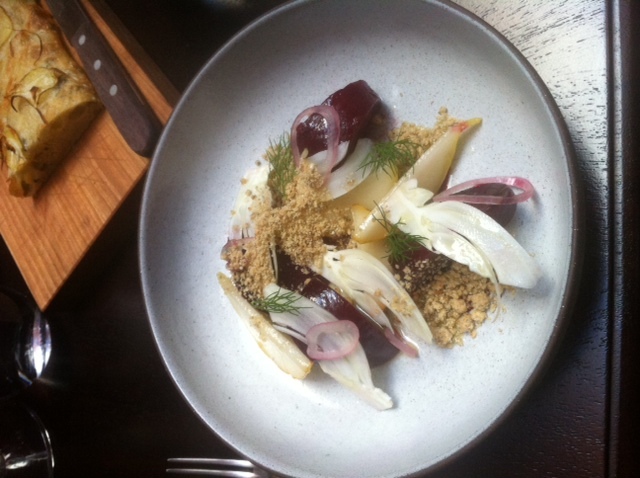 First Course and Starter: Roasted Beets with Fennel, Carraway and Pear. A delicious beginning to a great luncheon. Absolutely farm fresh ingredients and taste. My lunch partner ordered the equally delicious: Hamachi crudo with English peas and pea purree with olio verde topped with shaved fresh horseradish!! Just Incredible!! 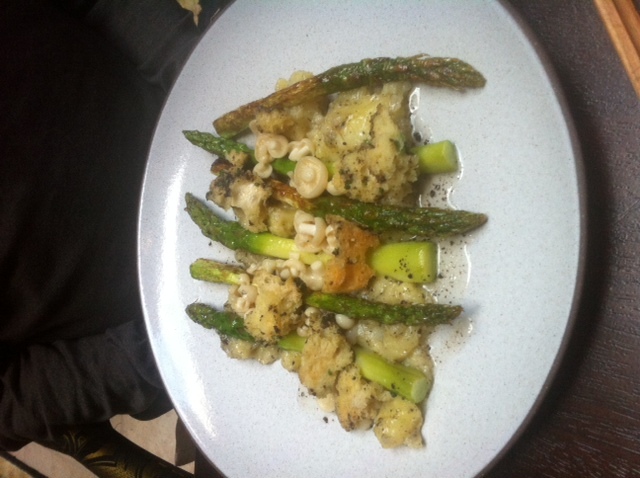 This amazing main course of Asparagus looks as beautiful as it tastes!! Again the absolutely freshest ingredients used expertly balanced and blended with black truffles, truffle oil, trumpet mushrooms, bread and smoked potato. 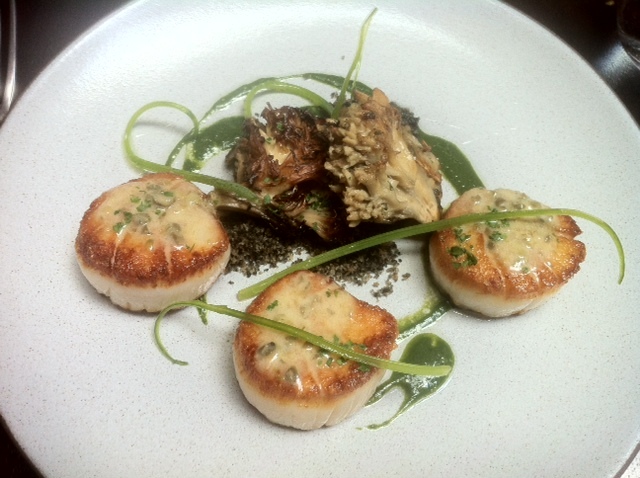 I chose this wonderful main course: Seared Scallops with sorrel, lemon and lightly braised maitake mushrooms. An incredibly light drizzle of a fennel/pea puree over the top!! 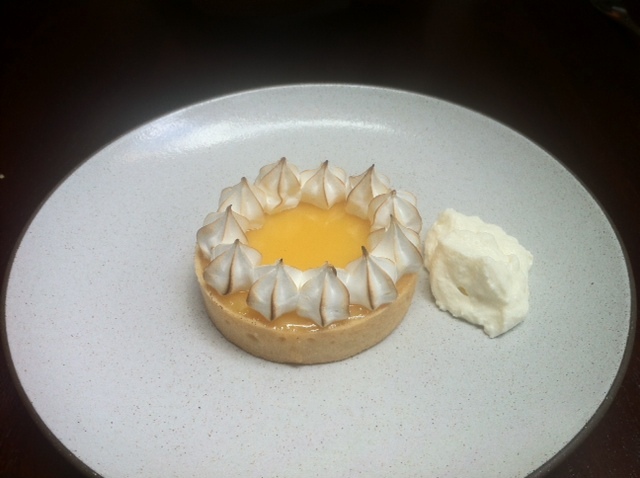 We chose to share this light as a feather Meyer Lemon Tart with little dots of meringue and just there on the side a small mound of ricotta cream. The well attended staff are all standing by to serve you; all with grace, efficiency and friendliness. The service is quite correct and attentive. The desserts are presented on an English Dessert Cart which is wheeled to your table and described in detail. The luncheon menu also has several pressed coffee options as well as a good assortment of teas. The NOMAD Hotel and Dinning Room is located at 1170 Broadway between 27th and 28th Streets. The Dinning Room is open daily for Breakfast, Lunch and Dinner. Telephone: (212) 796-1500. I highly recommend it and cannot wait to return!! This entry was posted in Hotel, New York, Restaurants and tagged Daniel Humm, Eleven Madison Park, New Restaurants of NYC, Nomad Dinning Room, Nomad Hotel NYC, NYC Restaurants, Restaurants in NoMad, Will Guidara. Bookmark the permalink. Michael – thank you for inviting me to join you for lunch – it was very good and I too wish to return to try dinner there!